This week I’m distributing flyers to all our students to remind them to renew their loans before they leave for the Christmas holidays, and also as a promo for our social media sites. As an incentive for ensuring their accounts are up-to-date, I’m offering a “little seasonal thank you” (chocolate Santas from M&S or similar). I hope this publicity will encourage students to update their accounts, call in at the library office to claim their treats and increase the numbers of Likes/followers on our social media sites. If you’d like to join in, please Like us or follow us! I would like to ‘like’ this blog post. An inspired idea! P.S. 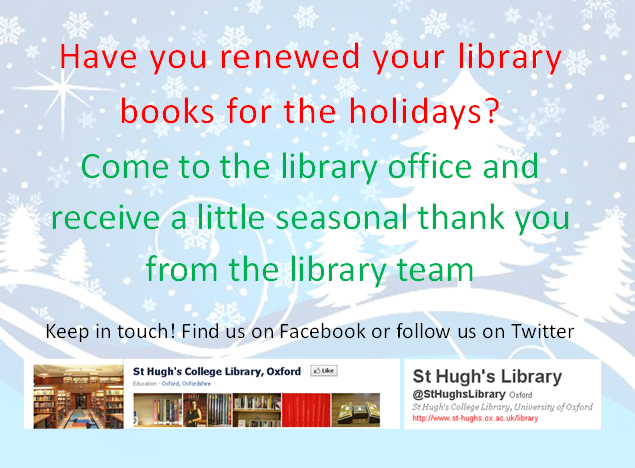 My library account is up to date – please may I have a chocolate? Of course! I’ll give it to you the next time I see you.